NeXtScale System is a new HPC offering from Lenovo. This new dense offering is based on our experience with iDataPlex® and BladeCenter® along with a tight focus on emerging and future client requirements. The Lenovo NeXtScale n1200 enclosure and NeXtScale nx360 M4 server are designed to optimize density and performance within typical data center infrastructure limits. The 6U NeXtScale n1200 enclosure fits in a standard 19-inch rack and up to twelve nx360 M4 servers can be installed into the enclosure. With more computing power per watt and the latest Intel Xeon processors, you can reduce costs while maintaining speed and availability. NeXtScale System is a new dense HPC offering, based on our experience with iDataPlex® and BladeCenter® along with a tight focus on emerging and future client requirements. The NeXtScale n1200 enclosure and NeXtScale nx360 M4 server are designed to optimize density and performance within typical data center infrastructure limits. The 6U NeXtScale n1200 enclosure fits in a standard 19-inch rack and up to twelve nx360 M4 servers can be installed into the enclosure. With more computing power per watt and the latest Intel Xeon processors, you can reduce costs while maintaining speed and availability. The following figure shows twelve NeXtScale nx360 M4 servers that are installed in an NeXtScale n1200 enclosure. NeXtScale System is built with industry-standard components to create flexible configurations of servers, chassis, and networking switches that integrate easily in a standard 19-inch rack. It is a general-purpose platform that provides flexibility to clients for creating unique and differentiated solutions using off-the-shelf components. Front-access cabling enables you to quickly and easily make changes in networking, power connections, and storage. Introducing NeXtScale System, which is a new generation Intelligent Cluster™ platform that follows on from the highly successful iDataPlex offering. Designed with industry-standard, off-the-shelf components, NeXtScale System is a general-purpose platform that is designed to give customers a flexible IT infrastructure. The offering initially will be available with compute-intensive systems, but the design allows for a mix-and-match approach, with I/O-rich, storage-rich, and GPU-rich offerings possible. Customized solutions can be configured to provide an application-appropriate platform with a choice of servers, networking switches, adapters, and racks. This modular system is designed to scale and grow with data center needs to protect and maximize IT investments. Because it is optimized for standard racks, users can easily mix high-density NeXtScale server offerings and non-NeXtScale components within the same rack. NeXtScale System also provides tremendous time to value by enabling users to set up and start it in a shorter period. The NeXtScale nx360 M4 server provides a dense, flexible solution with a low total cost of ownership (TCO). The half-wide, dual-socket NeXtScale nx360 M4 server is designed for data centers that require high performance but are constrained by floor space. By taking up less physical space in the data center, the NeXtScale server enhances density, and it supports the Intel Xeon E5-2600 v2 series up to 130 W and 12-core processors, thus providing more performance per server. The nx360 M4 compute node contains only essential components in the base architecture to provide a cost-optimized platform. 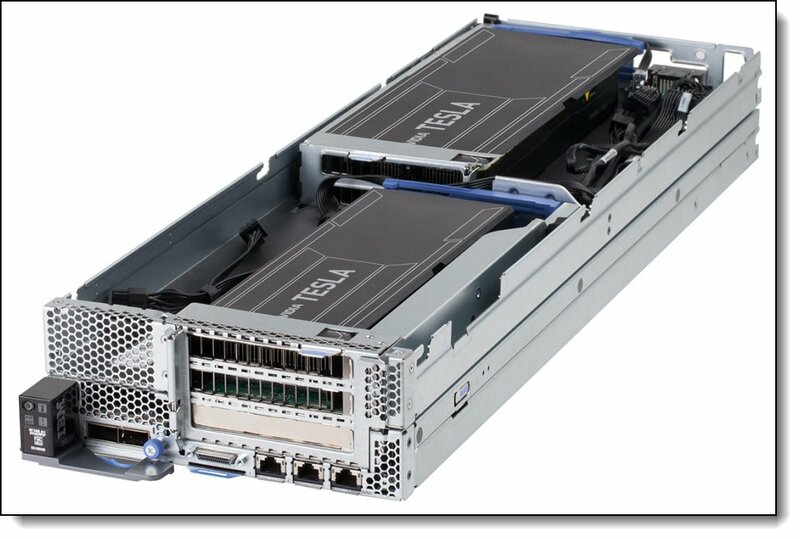 The nx360 M4 also supports additional expansion options in the form of trays that attach to the top of the server. The Storage Native Expansion Tray can be added to the nx360 M4 to form a storage-dense server supporting up to 32 TB of local storage. The PCIe Native Expansion Tray can be added to the nx360 M4 to form a powerful compute engine, supporting two GPU or coprocessor adapters. The NeXtScale n1200 Enclosure is an efficient, 6U, 12-node chassis with no built-in networking or switching capabilities, and therefore requires no chassis-level management. Sensibly designed to provide shared, high-efficiency power and cooling for housed servers, the n1200 enclosure is designed to scale with your business needs. Adding compute capability, or later storage or acceleration capability, is as simple as adding specific nodes to the chassis. Because each node is independent and self-sufficient, there is no contention for resources among nodes within the enclosure. 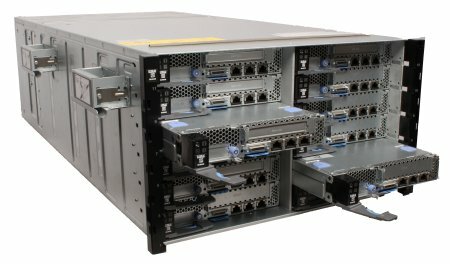 A typical rack holds only 42 1U systems, but this chassis doubles the density (up to 84 compute nodes within the same footprint). Up to 12 compute nodes, each with two of the latest Xeon processors, eight DIMMs, and two PCIe slots, in 6U of rack space. It is a highly dense, scalable, and price-optimized offering. The Intel Xeon processor E5-2600 v2 product family improves productivity by offering superior system performance with 12-core processors and up to 3.0 GHz core speeds, up to 25 MB of L3 cache, and QPI interconnect links of up to 8 GTps. Intelligent and adaptive system performance with Intel Turbo Boost Technology 2.0 allows CPU cores to run at maximum speeds during peak workloads by temporarily going beyond processor thermal design power (TDP). Intel Advanced Vector Extensions (AVX) improve floating-point performance for compute-intensive technical and scientific applications. Eight DIMMs of registered 1866 MHz DDR3 ECC memory provide speed, high availability, and a memory capacity of up to 256 GB. Support for additional local storage with the use of the Storage Native Expansion Tray. When using 4 TB HDDs, you can create an ultra-dense storage server with up to 32 TB of total disk capacity within 1U of comparable rack density. The nx360 M4 with the Storage Native Expansion Tray offers a perfect solution for today’s data-intensive workloads. Boosts performance with PCIe Native Expansion Tray by offering support for two high-powered GPUs or Intel Xeon Phi coprocessors within a single node . The use of solid-state drives (SSDs) instead of or with traditional hard disk drives (HDDs) can improve I/O performance. An SSD can support up to 100 times more I/O operations per second (IOPS) than a typical HDD. PCI Express 3.0 I/O expansion capabilities improve the theoretical maximum bandwidth by 60% (8 GTps per link) compared with the previous generation of PCI Express 2.0. There is support for 10 Gb Ethernet and FDR mezzanine cards that offer network performance without consuming a PCIe slot. With Intel Integrated I/O Technology, the PCI Express 3.0 controller is integrated into the Intel Xeon processor E5 family, which reduces I/O latency and increases overall system performance. Intel Execute Disable Bit functionality can prevent certain classes of malicious buffer overflow attacks when combined with a supporting operating system. Intel Trusted Execution Technology provides enhanced security through hardware-based resistance to malicious software attacks, allowing the application to run in its own isolated space that is protected from all other software running on a system. Shared 80 Plus Platinum power supplies ensure energy efficiency. Large 80 mm fans maximize air flow efficiencies. The Intel Xeon processor E5-2600 v2 product family offers better performance over the previous generation while fitting into the same TDP limits. Low-voltage 1.35 V DDR3 memory RDIMMs consume 19% less energy than 1.5 V DDR3 RDIMMs. SSDs consume as much as 80% less power than traditional 2.5-inch HDDs. The NeXtScale n1200 chassis supports N+N and N+1 power policies for its six power supplies, which means greater system uptime. Toolless cover removal provides easy access to upgrades and serviceable parts, such as HDDs and memory. The nx360 M4 offers memory mirroring for redundancy if there is a non-correctable memory failure. Optional RAID arrays enable the server to keep operating if there is a failure of any one drive. SSDs offer better reliability than traditional mechanical HDDs for greater uptime. Predictive Failure Analysis (PFA) detects when system components (processors, memory, and hard disk drives) operate outside of standard thresholds and generates proactive alerts in advance of possible failure, therefore increasing uptime. The built-in Integrated Management Module II (IMM2) continuously monitors system parameters, triggers alerts, and performs recovering actions in case of failures to minimize downtime. The IMM2 offers optional remote management capability to enable remote keyboard, video, and mouse (KVM) control of the server. There is a three-year customer replaceable unit and onsite limited warranty, with next business day 9x5. Optional service upgrades are available. The following figure shows the front of the nx360 M4 server. The compute nodes are installed in the NeXtScale n1200 enclosure, as shown in the following figure. The rear of the enclosure contains the power supplies, fans, and the Fan and Power Controller, as shown in the following figure. The following table lists the standard specifications of the NeXtScale nx360 M4 compute node and NeXtScale n1200 enclosure. Form factor Standard server: Half-wide, 1U compute node. With optional Native Expansion Tray: Half-wide 2U compute node. 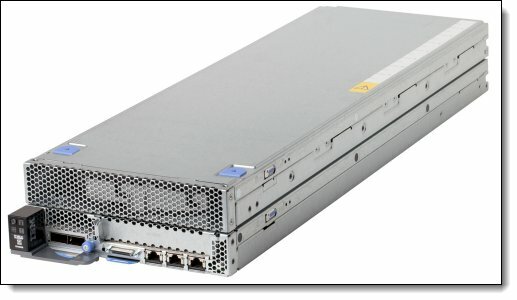 Supported chassis NeXtScale n1200 enclosure, 6U high; up to 12 compute nodes per chassis. Processor Two Intel Xeon Processor E5-2600 V2 series processors; QuickPath Interconnect (QPI) links speed up to 8.0 GTps. Hyper-Threading Technology and Turbo Boost Technology. Intel C602J (Patsburg-J) chipset. Memory Up to 8 DIMM sockets (4 DIMMs per processor) supporting DDR3 DIMMs up to 1866 MHz memory speeds. RDIMMs, UDIMMs and LRDIMMs supported. Four memory channels per processor (one DIMM per channel). Memory maximums Up to 256 GB with 8x 32 GB LRDIMMs and two processors. Disk drive bays Inside the nx360 M4: One 3.5-inch simple-swap SATA or two 2.5-inch simple swap SAS/SATA HDDs or SSDs, or four 1.8-inch simple-swap SSDs. Not front accessible. Adding the NeXtScale Storage Native Expansion Tray adds 7 more 3.5-inch simple-swap drive bays. Maximum internal storage With the Storage Native Expansion Tray: 32 TB using 8x 4TB 3.5-inch drives. Without the Storage Native Expansion Tray: 4.0 TB using 1x 4TB 3.5-inch drive. RAID support On some models: ServeRAID C100 6Gb SATA controller supporting RAID 0, RAID 1, and RAID 10. Implemented in the Intel C600 chipset. Optional hardware RAID with supported 6Gbps RAID controllers. Network interfaces Two Gigabit Ethernet ports using onboard Intel I350 Gb Ethernet controller. Optionally, two InfiniBand ports or two 10 GbE ports through a mezzanine card (which does not occupy the available PCIe slot). Ports Front of the server: KVM connector; with the addition of a console breakout cable (1 cable standard with the chassis) supplies one RS232 serial port, one VGA port, and two USB ports for local console connectivity. Three 1 Gbps Ethernet ports with RJ45 connectors: one dedicated for systems management (wired to the IMM), one dedicated for use by the operating system, and one shared by the IMM and the operating system. One slot for an optional mezzanine card ports (QSFP, SFP+, or RJ45, depending on the card installed). One internal USB port for VMware ESXi hypervisor key. Cooling Supplied by the NeXtScale n1200 enclosure. 10 hot-swap dual-rotor 80 mm system fans with tool-less design. Power supply Supplied by the NeXtScale n1200 enclosure. 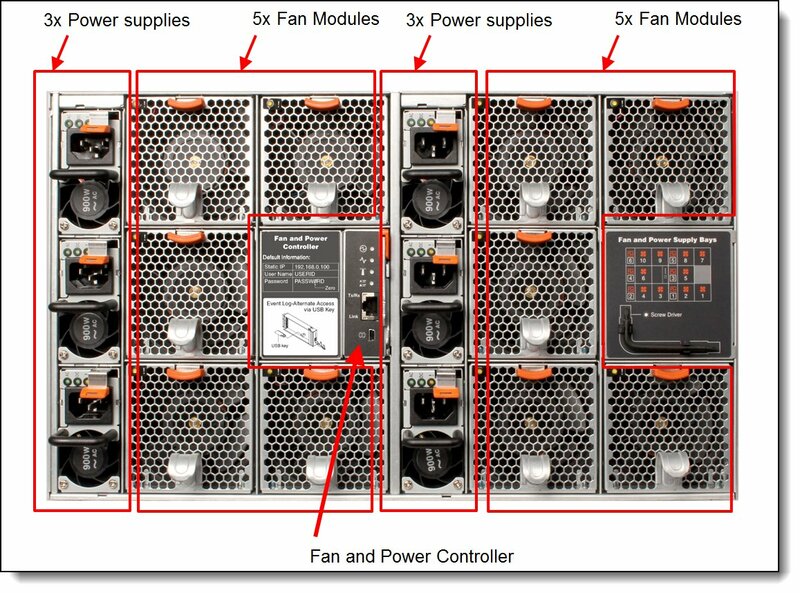 Up to six hot-swap power supplies either 900W or 1300W depending on the chassis model. Support power policies N+N or N+1 power redundancy. 80 PLUS Platinum certified. Systems management UEFI, Integrated Management Module II (IMM2) with Renesas SH7757 controller, Predictive Failure Analysis, Light Path Diagnostics, Automatic Server Restart, and ServerGuide. Browser-based chassis management through an Ethernet port on the Fan and Power Controller at the rear of the enclosure. IMM2 upgrades are available to IMM2 Standard and IMM2 Advanced for web GUI and remote presence features. Security features Power-on password, administrator's password, and Trusted Platform Module 1.2. Operating systems supported Red Hat Enterprise Linux, SUSE Linux Enterprise Server, Microsoft Windows Server 2008 R2 and 2008, and VMware vSphere Hypervisor. Limited warranty Three-year customer-replaceable unit and onsite limited warranty with 9x5/NBD. Service and support Optional service upgrades are available through ServicePac®: 4-hour or 2-hour response time, 8-hour fix time, 1-year or 2-year warranty extension, remote technical support for Lenovo hardware and some Lenovo and OEM software. † Processor detail: Processor quantity and model, cores, core speed, L3 cache, memory speed, and power consumption. For information about the standard features of the server, see the "Standard specifications" section. A green cell means that the chassis can be filled with servers up to the maximum number supported in the chassis (ie 12 servers without GPU Trays installed, 6 servers with GPU Trays installed). A yellow cell means that the maximum number of servers that the chassis can hold is fewer than the total available bays. Other bays in the chassis must remain empty. OVS (Oversubscription) of the power system allows for more efficient use of the available system power. By using oversubscription, users can make the most of the extra power from the redundant power supplies when the power supplies are in healthy condition. Oversubscription and Power supply redundancy options are set via one of the available user interfaces to the Fan and Power Controller in the chassis. Second number: Number of servers without a GPU Tray attached. For example, “5 + 1” means Supported combination is 5 servers with the GPU Tray attached (consuming 10 bays in the chassis), plus 1 server without a GPU Tray attached (1 bay). In such a configuration 11 bays are consumed and the 1 remaining server bay in the chassis must remain empty. See the GPU and coprocessor adapters section for information on the power consumption of each supported GPU or coprocessor. The standard n1200 Enclosure models are listed in the following table. The n1200 provides a shared high-efficiency power supply and fans. 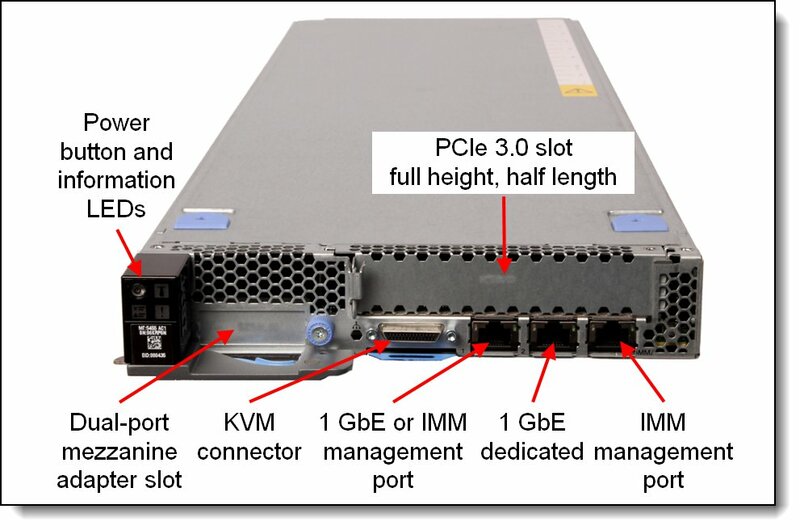 Like BladeCenter and Flex System™, the NeXtScale System compute nodes connect to a midplane, but this connection is for power and control only; the midplane does not provide any I/O connectivity. The nx360 M4 supports the processor options that are listed in the following table. * The first feature code corresponds to the first processor; the second feature code corresponds to the second processor. ** Processor detail: Model, core speed, cores, L3 cache, memory speed, and TDP power. Lenovo DDR3 memory is compatibility tested and tuned for optimal System x® performance and throughput. Lenovo memory specifications are integrated into the light path diagnostics for immediate system performance feedback and optimum system uptime. From a service and support standpoint, Lenovo memory automatically assumes the system warranty, and Lenovo provides service and support worldwide. The NeXtScale nx360 M4 supports DDR3 memory. The server supports up to four DIMMs when one processor is installed and up to eight DIMMs when two processors are installed. Each processor has four memory channels, and there is one DIMM per memory channel (1 DPC). RDIMM, UDIMM and LRDIMM are supported, but the mixing of these different types is not supported. The following table lists the memory options that are available for the nx360 M4 server. The server supports both 1.5 V and 1.35 V DIMMs. Mixing 1.5 V and 1.35 V DIMMs in the same server is supported. In such a case, all DIMMs operate at 1.5 V.
The following table shows the maximum memory speeds that are achievable. The table also shows the maximum memory capacity at any speed that is supported by the DIMM and the maximum memory capacity at the rated DIMM speed. * The maximum quantity that is supported is shown for two installed processors. When one processor is installed, the maximum quantity that is supported is half of that shown. The NeXtScale Storage Native Expansion Tray is a half-wide 1U expansion tray that attaches to the nx360 M4 to provide seven extra 3.5-inch simple-swap SATA drives. The tray allows the configuration of storage-rich nx360 M4 compute nodes. Note: The Storage Native Expansion Tray and the PCIe Native Expansion Tray cannot be connected to the same compute node. Ordering information is listed in the following table. The following figure shows the NeXtScale Storage Native Expansion Tray with the cover removed showing seven 3.5-inch drives installed. Drive cages for the drives internal to the nx360 M4 are as listed in the following table. Drives used in the Storage Native Expansion Tray do not need a cage. The following figure shows the three variations (the two 3.5-inch cages look similar). There are two 3.5-inch drive cages - the last two rows of the above table. If the Storage Native Expansion Tray is attached to the nx360 M4, then the use of the RAID cage (feature A4GE, option 00Y8615) allows you to configure a RAID array that spans all 8 drives - the 7 in the storage tray and the 1 drive internal to the nx360 M4. Such a configuration would be connected either to a ServeRAID M1115 adapter or N2115 SAS HBA. If the 3.5-inch HDD cage (feature A41J) is used, then a RAID array can only be formed with the 7 drives in the storage tray. In such a configuration, the drives in the storage tray are connected either to a ServeRAID M1115 adapter or N2115 SAS HBA, and the single drive in the nx360 M4 is connected to the ServeRAID C100. The following table lists the RAID controllers and SAS HBA that are used for internal disk storage of the nx360 M4 server. These are alternatives to the onboard SATA controller and one may be required depending on the storage configuration. The following table lists the adapters that are supported for each drive configuration. The on-board ServeRAID C100 SATA controller provides four channels, two at 3 Gbps and two at 6 Gbps. These connect to the four 1.8-inch drive bays in the nx360 M4. When installing only two 1.8-inch drives, install them in the top two drive bays to maximize performance, since the top two bays are the ones operating at 6 Gbps. When four 1.8-inch SS SATA SSD drives are installed, the two located at the top of the cage will operate at 6 Gbps while the two at the bottom will operate at 3 Gbps. An array involving drives at different speeds, will perform at the lowest speed. For example, a paired array between top drives will operate at 6 Gbps but, a paired array between a top drive and a bottom, will operate at 3 Gbps. When the Storage Native Expansion Tray is used one of the following disk controller adapters must be installed in the PCIe slot in the nx360 M4. 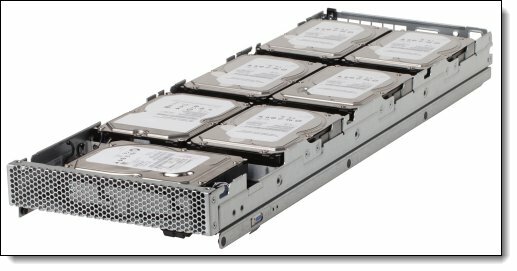 If you are using the ServeRAID M1115 controller and you have a 3.5-inch drive in the internal bay of the nx360 M4, and you wish to be able to form a RAID array with all 8 drives (1 in the server and 7 in the storage tray), then you must use the 3.5-inch RAID cage for the internal drive (feature A4GE, option 00Y8615), replacing the standard 3.5-inch HDD cage if already installed in the server. The 3.5-inch RAID cage includes a backplane that allows the internal drive to be connected to the drives in the storage tray. If you do not use the 3.5-inch RAID cage or you are using 2.5-inch or 1.8-inch drives in the nx360 M4, then the internal drives will be connected to a separate controller than the drives in the storage tray and you will not be able to form a RAID array spanning both internal drives and drives in the storage tray. The internal drives are connected to the ServeRAID C100 controller as indicated in the above table. Note: It is not a supported combination to have the Storage Native Expansion Tray with 7 drives along with two 2.5-inch SAS drives installed in the nx360 M4. This is because the ServeRAID C100 (which would be required to drive the two internal drives) does not support SAS drives. The use of 2.5-inch SATA drives are supported however. PCIe 2.0 x4 host interface. The ServeRAID C100 is an integrated SATA controller with software RAID capabilities. It is a cost-effective way to provide reliability, performance, and fault-tolerant disk subsystem management to help safeguard your valuable data and enhance availability. Note: The ServeRAID C100 is supported by Windows and Linux only. Depending on the operating system version, drivers might need to be downloaded separately. There is no support for VMware, Hyper-V, or Xen. The C100 supports SATA drives but does not support SAS drives. The following table lists hard disk drive options for the internal disk storage of the nx360 M4 server. Mixing HDDs: Simple-swap SATA HDDs and simple-swap SAS HDDs can be intermixed in the system, but cannot be intermixed in the same RAID array. Mixing HDDs and SSDs: Both simple-swap SATA HDDs and simple-swap SAS HDDs can be intermixed with SSDs in the system. SAS or SATA HDDs cannot be configured with SSDs within the same RAID array. * 1 drive supported without the Storage Native Expansion Tray. 8 drives supported with the Storage Native Expansion Tray. The server does not support internal optical drive options. Instead, use an external USB drive. See http://support.lenovo.com/en/documents/pd011281 for options. The NeXtScale PCIe Native Expansion Tray is a half-wide 1U expansion tray that attaches to the nx360 M4 to provide two full-height full-length double-width PCIe 3.0 x16 slots. The tray is designed to support two GPU adapters or coprocessors. Note: The PCIe Native Expansion Tray and the Storage Native Expansion Tray cannot be connected to the same compute node. The following figure shows the PCIe Native Expansion Tray attached to an nx360 M4 (shown with the top cover removed). The figure shows two NVIDIA GPUs installed. When the PCIe Native Expansion Tray is used, it is connected to the compute node via two riser cards, each providing a PCIe x16 connector to the GPUs or coprocessors installed in the tray. 1-slot PCIe 3.0 x16 riser card installed in the rear riser slot (riser slot 2 - see Figure 3). This riser is used to connect the rear adapter in the PCIe Native Expansion Tray. Only GPUs and coprocessors are supported in the PCIe Native Expansion Tray and only those listed in the following section. The PCIe Native Expansion Tray also includes the auxiliary power connectors and cables for each adapter slot necessary for each supported GPU and coprocessor. The nx360 M4 supports GPU adapters and coprocessors when the NeXtScale PCIe Native Expansion Tray is attached, as described in "NeXtScale PCIe Native Expansion Tray" The following table lists the supported adapters. The operating systems supported by each GPU and coprocessor adapter is listed in the "Supported operating systems" section. The nx360 M4 server also supports an additional mezzanine card with a dedicated PCIe x8 slot at the front of the server, as shown in Figure 2. The supported adapters are listed in the following table. The following table lists additional supported network adapters in the standard full-height half-length PCIe slot. * Available only via CTO or special bid. The following table lists the storage HBAs that are supported by the nx360 M4 server. The NeXtScale n1200 enclosure supports up to six redundant hot-plug power supplies, providing N+N or N+1 redundancy Power policies with no redundancy is also supported. These High Efficiency (HE) Platinum AC power supplies are 80 PLUS Platinum certified to allow for the best efficiency values of your data center. The following table lists the supported power supply option. The server supports VMware vSphere (ESXi), which is installed on a USB memory key. The key is installed in a USB socket inside the server. The following table lists the virtualization options. The nx360 M4 provides local console access through the KVM connector on the front of the server. A console breakout cable is used with this connector which provides a VGA port, two USB ports and a DB9 serial port. The cable is shown in the following figure. One console breakout cable is shipped with the NeXtScale n1200 enclosure. Additional cables can be ordered per the following table. Tip: This is the same cable that is used with Flex System, but has a different part number because of the included materials. To aid with problem determination, the server includes light path diagnostics, which is a set of LEDs on the front of the server and inside the server that show you which component is failing. The LEDs are shown in the following figure. 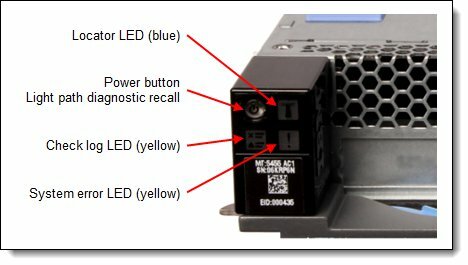 When an error occurs, the system error LED lights up. Review the logs through the web interface of the IMMv2 (see the "Remote server management" section). If needed, power off the server and remove it from the enclosure. Then, press and hold the power button to activate the system board LEDs. The LED next to the failed component lights up. The server contains Integrated Management Module II (IMM2), which provides advanced service-processor control, monitoring, and an alerting function. If an environmental condition exceeds a threshold or if a system component fails, the IMM2 lights LEDs to help you diagnose the problem, records the error in the event log, and alerts you to the problem. The server includes IMM2 Basic and can be upgraded to IMM2 Standard and IMM2 Advanced with FoD licenses; however, you might need to upgrade the system firmware to the latest levels (at least level 28n) to support these upgrades. The following table lists the remote management options. The nx360 M4 provides a dedicated Ethernet port that allows connection to the IMM2. It is a port to access the IMM2 separately from the onboard two-port 1 Gb Ethernet controller. Alternatively, the first 1 Gb Ethernet port from the onboard controller can be configured in Shared mode in order to allow access to the IMM2. With Shared mode enabled, the dedicated IMM port is disabled. The NeXtScale n1200 Enclosure offers a remote management capability through the Fan and Power Controller, which is at the back of the enclosure. The Fan and Power Controller has one external RJ45 port which provides a 10/100 Mbps Ethernet connection for browser-based remote control. The FPC also includes a USB key housed in side the unit. 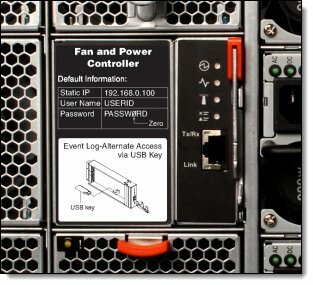 The USB key stores the event log for the FPC plus power, cooling and network configuration data. The following table lists the operating system support for GPUs and coprocessors. The NeXtScale nx360 M4 compute node complies with ASHRAE class A3 specifications. The server supports attachment to external storage expansion enclosures, such as the EXP2500 series, by using either the ServeRAID M5120 (6 Gbps) or M5225 (12 Gbps) SAS/SATA Controller. The controllers supports connectivity to the external expansion enclosures that are listed in the following table. Up to nine expansion enclosures can be daisy-chained per one adapter port. For better performance, distribute expansion enclosures evenly across both adapter ports.